Features a hand-woven rattan style that will add a touch of exotic to your dining room furnishings. 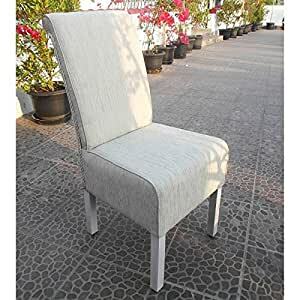 Built with a long-lasting mahogany frame done in white wash, with a natural woven rattan trim and ivory fabric. Seat is 19 inches wide x 20 inches deep. Comes in a set of two.